Arguments are the values that functions use to perform calculations. 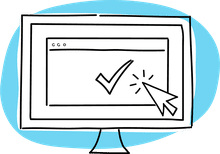 In spreadsheet programs such as Excel and Google Sheets, functions are just built-in formulas that carry out set calculations and most of these functions require data to be entered, either by the user or another source, in order to return a result. A function's syntax refers to the layout of the function and includes the function's name, parenthesis, comma separators, and its arguments. The arguments are always surrounded by parentheses and individual arguments are separated by commas. The OFFSET function, meanwhile, has three required arguments and two optional ones. Other functions, such as the NOW and TODAY functions, have no arguments, but draw their data — the serial number or date — from the computer's system clock. Even though no arguments are required by these functions, the parentheses, which are part of the function's syntax, must still be included when entering the function. Like the number of arguments, the types of data that can be entered for an argument will vary depending upon the function. It is common for one function to be entered as the argument for another function. This operation is known as nesting functions and it is done to extend the capabilities of the program in carrying out complex calculations. For example, it is not uncommon for IF functions to be nested one inside the other as shown below. In this example, the second or nested IF function is used as the Value_if_true argument of the first IF function and is used to test for a second condition, if the data in cell A2 is less than 100. Since Excel 2007, 64 levels of nesting are permitted in formulas. Prior to that, only seven levels of nesting were supported. 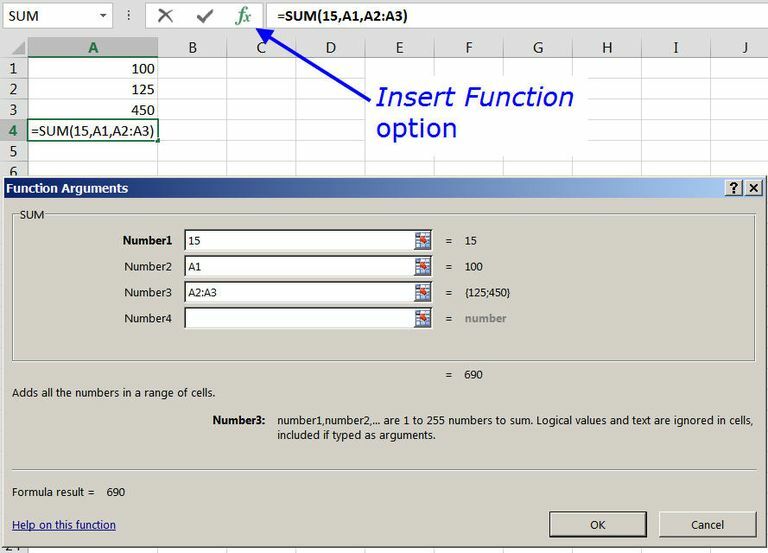 The vast majority of functions in Excel have a dialog box, as shown for the SUM function in the image above, that lists the required and optional arguments for the function. clicking on the Insert Function option located next to the formula bar, as indicated in the image above. Enter an open parenthesis - the specified function and its arguments are listed in the tooltip. In Excel, the tooltip window surrounds optional arguments with square brackets ([ ]). All others listed arguments are required. In Google Sheets, the tooltip window does not differentiate between required and optional arguments. Instead, it includes an example as well as a summary of the function's use and a description of each argument.